Our beadmaker who makes all our Fiorato decorated beads decided to try something different as his wife wanted new drawer pulls in her bathroom. So he got some threaded screws and just made the drawer pull like his beautiful beads but on top of the screw. They are beautiful. The measure anywhere from 22mm to 25mm and of course each one a bit different.They are the same fabulous Venetian Beads he has been making for the last 35 years but now with a new purpose. They are beautiful for home decor in bathrooms, or in that all so feminine kitchen. 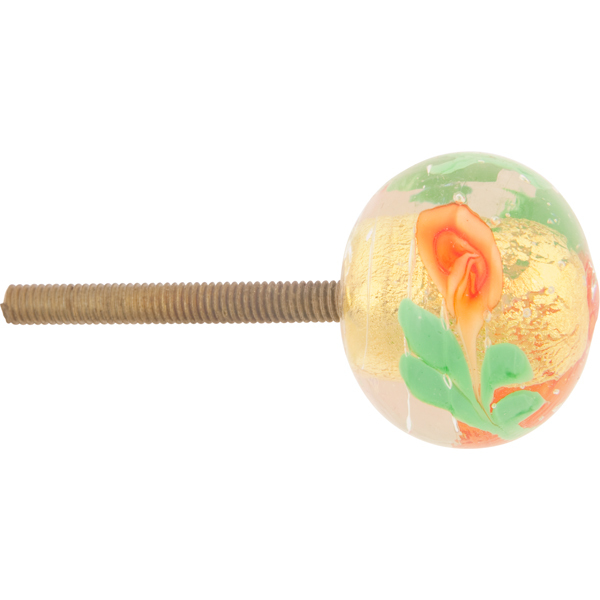 The length of the screw is approximately 30mm or about 1 1/4 inch. The color is clear Murano Glass enacasing 24kt gold foil with a orangey rose and green leaves. No two are ever exactly alike. This makes the perfect finish to your beading area or bathroom.